Provide comfort for the family of Eileen Van Zee with a meaningful gesture of sympathy. Eileen Joyce Van Zee, 85, of Platte, SD passed away Sunday, January 13, 2019 at her home. Funeral Services are 10:30 A.M. Saturday, January 19, 2019 at Calvary Baptist Church in Platte. A Committal Service will follow at Platte City Cemetery. Visitation will be held from 5:00 – 7:00 P.M. Friday, January 18, 2019 at Mount Funeral Home in Platte with a 7:00 P.M. Prayer Service. Eileen Joyce (Ligtenberg) Van Zee was born on September 2, 1933 to Gerrit and Florence (Star) Ligtenberg in their home in Douglas County, SD. She attended Corsica Christian Grade School through the eighth grade. On April 15, 1952, Eileen was united in marriage to Andrew G. Van Zee at the Christian Reformed Church in Corsica, SD. To this union five children were born: Judy, Jerry, Linda, Lori and Lisa. Eileen did many things in her life. She worked at Eastman Drug and painted at Andy’s Plastic and Novelty factory in Platte, SD. Eileen worked at the Aristo Café in Platte and also made over 20,000 monster cookies for Donna’s Food Shop in Platte. She finished her working career preparing baked beans and potato salad for Boom’s Drive Inn. Eileen was also a faithful AWANA leader to many young children at the Calvary Baptist Church. Eileen loved reading books and cross stitching. She made each of her grandchildren a hand cross stitched quilted blanket when they were born – some of them were well used but well appreciated. Eileen also attended night classes at Mitchell Vo Tech for cake decorating. She made all five of her kids’ wedding cakes and many of her grandchildren’s birthday cakes. Grateful for having shared in Eileen’s life: four children, 14 grandchildren and 28 great grandchildren: Judy (Harley) Sprik of Platte, SD parents of: Tamara (John) Trammel – Tyler, Troy (Kristina) Sprik – Trevor, Brady, Halle and Hayden, Kimlyn (Brent) Powers – Samantha and Jeremiah, Andree (Gabriel) Lira – Avery and Abigail; Jerry (Betty) Van Zee of Platte, SD parents of: Jessica (Troy) Rempfer – Tayla and Tayden, Buck (April) Van Zee – Bane, Bennet, Tucker and Shaylene, Sean (Maria) Van Zee, Jacque (Eric) Summerville – Grace and Riley; Linda (Joel) Olivier of Presho, SD parents of: Cody Olivier – Lane and Abigail, Clay Olivier – Chesney and Quincy, Charis (Tyrell) Bischoff – Oakley and Cinch; Lisa (Robert) Creasey of Geddes, SD parents of: Bailey Creasey – Riley; son-in-law, Doug Dyk and wife, Roxane of Platte, SD parents of: Travis (Farrah) Dyk – Lydia and Dominic, Tyson Dyk (friend, Maggie Foxley) – Paxton and Owen; two brothers: Mike (Evalou) Ligtenberg of Mitchell, SD and James Ligtenberg of Dixon, IL; two brothers-in-law: Leonard DeVries of Corsica, SD and Norman DeHaai of Harrisburg, SD; along with many nieces and nephews. Eileen was preceded in death by her husband, Andy (May 4, 2018); her daughter, Lori Dyk (1999); a great grandson, Kegan Trammel; her parents, Gerrit and Florence Ligtenberg; a brother, Robert Ligtenberg; and two sisters: Ruby DeVries and Phyllis DeHaai. To send flowers in memory of Eileen Joyce Van Zee (Ligtenberg), please visit our Heartfelt Sympathies Store. We encourage you to share your most beloved memories of Eileen here, so that the family and other loved ones can always see it. You can upload cherished photographs, or share your favorite stories, and can even comment on those shared by others. Thinking of you with love and prayers. 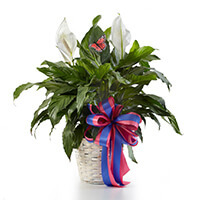 Your Jenks Water Aerobics Friends purchased the Classic Peace Lily for the family of Eileen Van Zee. To the family of Eileen . . so sorry to hear of the passing of your mom. Its never easy to lose your parent, no matter their age. I remember lots of fun times staying at your house years and years ago. Thoughts and prayers to your family.